TS MJP Gurukulam Inter Provisionally Selections List/ MJPTBCWREIS RJC CET 2019 Admission Counseling 2019 notification /MJPTBCWREIS Inter first year Admissions Certificate Verification 2019/ MJP Telangana BC Welfare intermediate Admissions Counseling 2019: Telangana State Mahatma Jyothiba Phule BC Welfare Educational Institutions Society would be issued the MJPTSBCWREIS RJC Entrance test 2019 Notification in the month of March 2019 for admissions into inter groups in in TS MJP BC Welfare Residential Junior Colleges in Telangana State for the academic year 2019-2020. BC Welfare REIS invited the online applications as per its schedule through online mode from the eligible students who were passed or SSC Class appeared students for admission into Inter groups in MJPTBC Welfare Residential Junior Colleges in Telangana State for the academic year 2019-2020. The entrance test had been conducted at mandal level centers on declared date and results of entrance test has been announced. Now, MJP BC Welfare has issued the inter admission counseling notification for certificate verification of provisional selected candidates. The provisional selected candidates list has been placed on TS MJP Gurukulam web portal. According to the officials, the certificate verification will be conducted may be in June, 2019 at at MJPTBCW Residential School for Boys, Maheshwaram, Ranga Reddy District in June 2019 from 9.30 am onwards. Candidates should attend the counseling along with following documents for admission into 5th Class for the academic year 2019-2020. 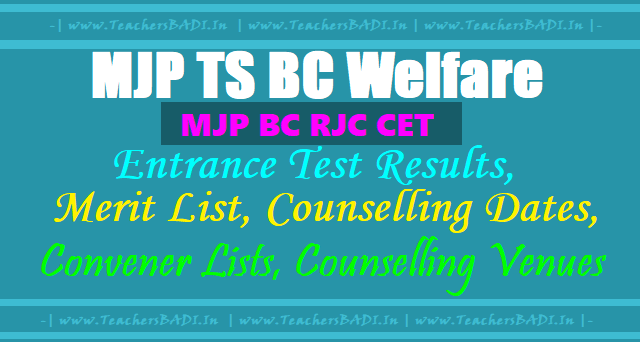 MJP TS BC Welfare TSRJCCET 2019 Admissions 1st Phase counselling dates, venue with Provisional Selected candidates list are announced .. Attend Counseling(Those who have Selected in the above List) at 10:00 am on Mentioned date in your Provisionally Shortlisted for First Councelling for admission into MJP Residential Junior Colleges at (Mentioned in Provisionally Shortlisted for First Councelling), with following Original Certificatess and fee of Rs. 1025/-. Candidates are called for admission counselling in certain ratio to the available seats and called in the ratio of 1:2. Hence, admission is not assured for all shortlisted candidates. Admission will be provided based on the merit, rule of reservation. a) Original pass Certificate of SSC or its equivalent Exam and Marks Memo/ at least internet copy. c) Transfer Certificate (T.C) from the Head of the institution. d) Permanent Caste Certificate issued by the Tahsildar concerned for B.C., S.C and S.T Students. e) Physical Fitness Certificate from the Doctor not below the rank of Asst. Civil Surgeon. f) Three Sets of Xerox Copies of all the above Certificates. Six latest Pass port size photographs. h) Income Certificate issued by Tahsildar (Annual Income of the Parents/ Guardian shall not exceed Rs. 1,50,000/- for rural area candidates and Rs.2,00,000 for Urban area candidates. i) In case of students of MJPTBC Residential Schools, Evidence of their study issued by the Principal, shall be produced. k) Aadhar Card Xerox Copy.